Our bronze sculptures are made using the ancient lost wax casting process. 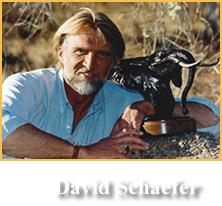 The original model for a bronze sculpture can be made from almost any material, David Schaefer sculpts his original model using a very soft plastline clay. After spending many weeks perfecting the clay models anatomy and capturing the exact details and texture, the model is then ready to begin the lost wax process. The following steps are carried out by experienced foundry craftsmen and the sculptor himself, not one of those steps is automated.